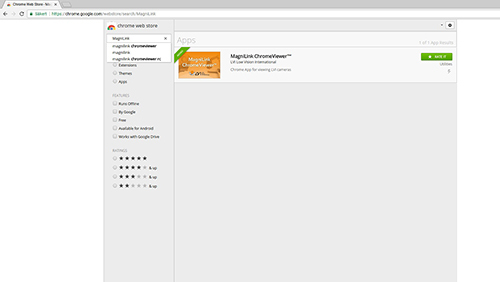 MagniLink ChromeViewer TM is designed for Chromebooks and is easily downloaded from Chrome Web Store. 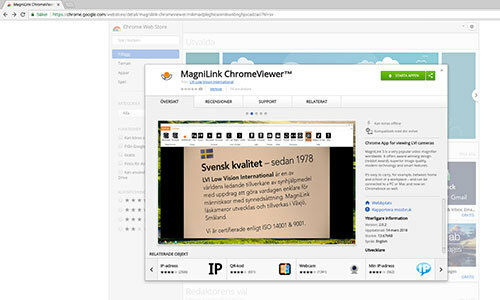 Link directly to the MagniLink ChromeViewer app in Chrome Web Store. - Acquire the OCR package and link your Google Drive account to be able to perform OCR inside ChromeViewer. - Select an area directly on the video feed to perform OCR or drag-and-drop images directly into ChromeViewer. - Use together with ChromeVox for text-to-speech capabilities. - Store sessions for later use. The color of the scroll bar has been adjusted slightly for increased visibility. Using space bar to tick split view modes in application settings will also scroll down if possible. Toggling Always on Top (Ctrl + A) will also in some cases set the window size & location to its previous state. It is possible to make the reference line to move forever by releasing Ctrl before the arrow keys, this also applies to focus distance. Longer video recordings crashes ChromeViewer. This has been reported to Google. Recovering from sleep mode requires the camera to be re-enumerated by pressing 0.
features you want to show. - control camera zoom, focus, contrast and lamp brightness levels. - save snapshots or record videos. Rotation and mirroring are now reflected on snapshots. It is now possible to snapshot a frozen video feed. Recording videos now also records audio if a microphone is available. Recorded videos (.webm) are now searchable. Fixed a bug which would sometimes incorrectly update the video resolution.